New research showed that people with the worst memory problems also had the most leakage in their brain’s blood vessels – regardless of whether amyloid or tau were present. Leaky capillaries in the brain portend early onset of Alzheimer’s disease as they signal cognitive impairment before hallmark toxic proteins amyloid and tau appear, new USC research shows. The number of Americans with Alzheimer’s is expected to more than double to about 14 million in 40 years, according to the Centers for Disease Control and Prevention. There are currently five Alzheimer’s drugs approved by the U.S. Food and Drug Administration that temporarily help with memory and thinking problems, but none that treat the underlying cause of the disease or slow its progression. Researchers believe that successful treatment will eventually involve a combination of drugs aimed at multiple targets. USC’s five-year study, which involved 161 older adults, showed that people with the worst memory problems also had the most leakage in their brain’s blood vessels – regardless of whether abnormal proteins amyloid and tau were present. In addition to Zlokovic, Toga and Nation, the study’s authors are Melanie Sweeney and Axel Montagne of USC, who are co-first authors with Nation; Abhay Sagare, Lina D’Orazio, Maricarmen Pachicano, Farshid Sepehrband, Amy Nelson, John Ringman, Lon Schneider, Helena Chui and Meng Law, all of USC; Tammie Benzinger, John Morris and Anne Fagan of the Washington University School of Medicine in St. Louis; and Michael Harrington and David Buennagel of Huntington Medical Research Institutes in Pasadena. The study was supported with grants from the National Institutes of Health (R01AG023084, R01NS090904, R01NS034467, R01AG039452, 1R01NS100459, 5P01AG052350, 5P50AG005142, P01AG052350, RO1AG054434, R21AG055034, R01AG055770, P50AG05681, P01AG03991 and P01AG026276), an Alzheimer’s Association Strategic 509279 Grant, the Cure Alzheimer’s Fund, the Fondation Leducq and the L.K. Whittier Foundation. 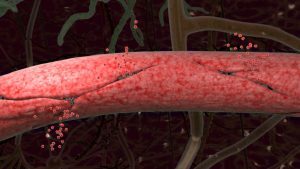 Illustration caption: This rendering of a blood vessel in the brain shows how leaks allow substances to seep into areas where they don’t belong.